All you need to replace the air control in your B & Q whirlpool bath. This kit gives you the necessary equipment to replace your air control valve with push button on/off. 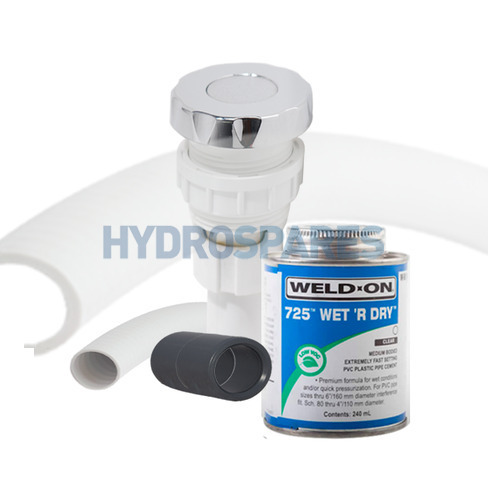 Simply remove the nut from the underside of your bath rim holding the control valve. Pull off the 3mm on/off hose connected to the side of the control valve. Install the 20mm connector using the PVC glue to the remaning 20mm pipe going to your bath and fit the 20mm flexible pipe into the other side of the connector. Run the newly installed flexible hose up to through the hole where your air control was and trim the pipe so there is about 5 cm sticking up. Make sure the nut that holds the control valve to the bath is over this new bit of pipe before you glue the pipe to the bottom of the control valve. Once glued push the control valve into place and re-do the nut up that holds the valve in place. Re-fit the 3mm hose to the side of the valve.